Our Lady of Mount Carmel in Chile always falls on July 16th each year with the holiday substituting for Corpus Christi holiday. The Catholic Church in Chile made this change on December 27, 2006. 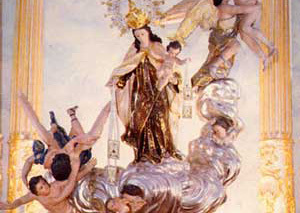 The Chilean Bishops back in 1923 asked the Vatican to proclaim the Virgin of Carmel be the patron saint of all Chileans. People on this day will attend church and pay homage to their patron saint. Back in 1811 both General Carrera and O'Higgins asked the Vicar of Santiago to give mass in support of the fight against the Spanish rulers at that time and in the Church as a statue of Our lady of Carmel where General Jo de San Martin named her the patron saint of the Army of the Andes. Later General O'Higgins proclaimed Lady of Mount Carmel to be the patroness and general of the Chilean Army. The Chilean army defeated the Spanish Army.